Growing up in a large family taught Fran Forgette a lot about involvement. And it wasn’t just family that held his attention and compassion. Just name a cause near and dear to the hearts of Tri-Citians, and chances are good Forgette is involved, one way or another. Are environmentalists demanding the removal of the four lower Snake River dams? There’s Fran — organizing the Save Our Dams effort and voicing TV spots encouraging community members to attend a pro-dam rally on the cable bridge. If school teachers are reaching into their own wallets to pay for classroom technology, there’s Fran, creating a grant program to channel money for software and computer peripherals to most every elementary school in the area. For his efforts to rally community support for the four dams, his efforts to help teachers pay for classroom technology and countless other projects, Francois X. Forgette was honored Saturday night as the 2001 Tri-Citian of the Year by the Rotary Clubs of the Tri-Cities. As is tradition, the club kept the identity of its honoree secret until the last possible second, when Forgette’s name was announced by John Nolan, the 2000 Tri-Citian of the Year. “Wow! This is so neat,” a clearly surprised Forgette said once the thunderous applause died down. Forgette certainly wasn’t expecting the honor — when Nolan was getting ready to introduce the winner, he left for the restroom. Nolan had to drag out his introduction until the man of honor returned. Forgette, a Kennewick attorney, soon found himself surrounded by his wife, Debbie, and two sons, Joey and Patrick. Also present were his mother and one of his sisters. He introduced them to the packed ballroom at the Pasco Doubletree, keeping up a lively banter with his sons and colleagues. Forgette was nominated by James Spracklen, director of the Department of Energy’s office of security and emergency services — and one of Forgette’s neighbors in Kennewick. In his nomination, Spracklen noted Forgette not only lends his name and energy to a dizzying array of causes and agencies, but also strikes a balance in his life. “Fran has been able to balance family, business and social life while being a leader in our community who is not afraid of a battle or to share a tender heart with someone in need,” Spracklen observed. Forgette’s civic résumé is extensive. He has presided over the Tri-Cities Cancer Center, the Tri-City Area Chamber of Commerce and the Estate Planning Council. He has served on the boards of the Boys and Girls Club, Catholic Family and Child Services, the Kennewick School District’s facilities and technology committee, the Mid-Columbia Education Alliance, the Safetown Project and the Save Our Dams project. He lends his professional expertise to the Tri-Cities Industrial Development Council. In the education arena, he is best known for creating the Adopt-A-Disk program after he visited his son Joey’s elementary school class in 1995. There, Forgette was impressed by a classroom computer project — and dismayed to find the teacher, Ron Trautman, had bought the gear with his own money. From modest beginnings in 1995, Adopt-A-Disk has become a communitywide grant program that funnels $500 each to all elementary schools in six area districts and a handful of private schools. The money helps teachers purchase software and peripherals they can use for special class projects and motivate kids to investigate math, history and other topics. The Kennewick School District honored his efforts in 1997 when it named him an Outstanding Partner. In the business arena, Forgette was president of the Kennewick Chamber of Commerce when it became the Tri-City Area Chamber in a bid to give the region another strong voice. He also donates his legal expertise to the Tri-City Industrial Development Council as its volunteer counsel. Forgette was president of the chamber when he delved into salmon recovery issues and came to be a community spokesman for saving the four hydroelectric dams on the lower Snake River. He also has led efforts to restart the Fast Flux Test Facility to produce medical isotopes. He’s well known in the medical community, too, where he has served the cancer center in a variety of positions, including president, board member, counsel and chairman of the negotiation team. Forgette has been honored in the legal profession, as well. Last fall, he was among seven attorneys statewide to receive the Washington State Bar Association’s “Proud to be a Lawyer” award for his civic work. Forgette is a partner with the Kennewick law firm of Rettig, Osborne, Forgette, O’Donnell, Iller & Adamson. 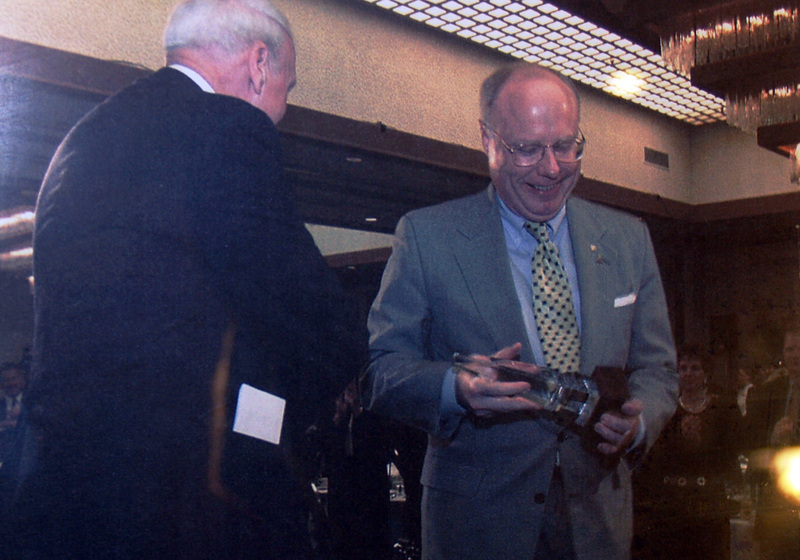 The Tri-Citian of the Year program dates to 1963 when Sam Volpentest was honored as the first winner.